It often seems Search Engine Optimization boils down to a battle royale over keyword. Websites stake out their high search volume, high competition keyword; battle lines are drawn. From social media strategies to rapidly updated blogs to link building campaigns, websites maneuver to have greater search engine equity. Unfortunately, websites often win the battle only to find the victory hollow. The keyword wrested from the hands of their enemies don’t equal the legions of new customers or hoards of adoring fans that they expected. Their hard work has earned them but an empty title. There are two lessons to be learned here: high powered keywords are not always to be coveted and finely tuned research is never a waste of time. Everyone wants to rank highly for the big keywords. There’s nothing more gratifying than finding your website sitting pretty on that first page. This prominent placement, however, is not a golden ticket to successfully driving targeted traffic. Head keywords comprise only a small portion of overall searches. A study Bill Tancer did in 2008 helps illustrate the importance of long tail keyphrases. He did a study on 14 million searches and found that the top 10,000 keywords in his sample only brought in 18.5% of the searches. The remaining keywords, called “long tail keywords”, made up the remaining 81.5%. Clearly, this means placing endless resources into cornering the market on a small handful of keywords is not an effective strategy. That’s not to say that keyword research is to be ignored. It’s fairly safe to say that head keywords are indicative of where public interest lies. If many people search for “sprockets” each month, you can be sure people are searching for related long tail keywords that include the word “sprocket”. Similarly, if your research shows that only a handful of people search for “gizmo” a month, you’ll likely see minimal long tail keywords surrounding that topic. This keyword research can then be used with great success to determine a category, or even the terminology, best used to garner long tail queries. For example, when using a tool such as Google Adwords to search for key phrase “spaghetti”, the related results show that “spaghetti noodle” has a much higher search volume than “spaghetti pasta.” As spaghetti noodles have a high search volume, there are bound to be many long tail keywords surrounding the phrase. Writing well-informed copy that touches on a variety of spaghetti related subjects is likely to bring in more searches than trying to claw your way to the front page for “spaghetti noodles”. Effective SEO is always an exercise in moderation. If your website is trying to sell sprockets, writing a dissertation on the history, popular opinion, and news coverage of sprockets will likely do very little to actually sell sprockets. 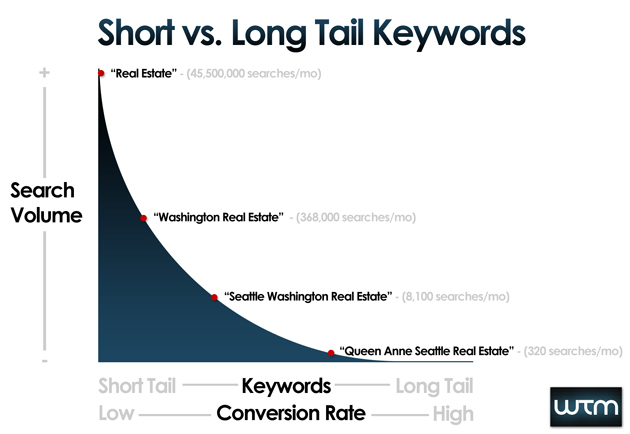 Your copy should gear towards long tail keywords that will actively help with your goal. For selling sprockets, the copy might discuss why sprockets are a better choice than widgets, how buying a sprocket can help save you money, and why your sprockets are superior to other sprockets. By adding relevant content, you are likely to pull more qualified customers by narrowing down customer intent. Landing on the first page for “nails” isn’t helpful if your company sells nails, as user intent could be for hardware or a nail salon. By creating broad content about selling nails, you’re more likely to show up on the first page of a variety of long tail queries about buying nails, instead of stuffed between nail salon information. When aiming for long tail keywords, SEO basics are still in effect. Optimize header and title tags. Write keyword rich meta descriptions. Use appropriate anchor text for internal linking. The biggest difference in optimization when targeting long tail keywords is going with big picture ideas when possible. Actively optimizing header and title tags for long tail keywords isn’t possible. As such, supply headers and titles with big picture keywords, and let the copy supply the data for long tail keywords. Instead of optimizing headers and titles with “sprocket installation tips” use “sprocket installation”. This shorter title gives the page greater flexibility without losing its intended direction. The push for page ranking for a handful of keywords is the classic problem of not seeing the forest for the trees. What you have to understand is that behind those big keywords are literally tens of thousands of long tail key phrases. By generating broad but relevant content, and using keyword research to help shape your decisions, you can tap into these long tail keywords and bring in a wealth of customers, without the hassle of the battle royale. What long-tail key phrases would you like to own? Let us know in the comments!